November is a special month for honoring veterans. Not only is November 11 set aside as Veterans Day, but the entire month is designated as Military Family Month. In honor of these two occasions, Hire a Hero is spotlighting a military family right here at Orion. Nora Liles is a National Recruiter at Orion in our Virginia Beach, VA, office, specializing in assisting transitioning and former military officers in their career search. Nora, her husband, Charles, and sons Collison, 2, and AJ, 3 months old, are a Navy family. LCDR Charles Liles is an F-18 pilot who has been in the military for 14 years. 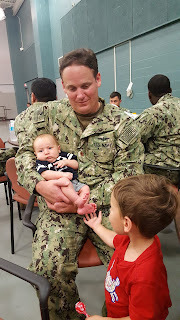 Charles is a USNA graduate who commissioned in 2002 and has previously deployed to Iraq and Africa. One of the most difficult times in the life of a military family is when they are separated due to deployment. And it is during Military Family Month that it’s important to remember how important friends and neighbors can be, especially when extended family is far away. “I am very fortunate to have a strong network of friends here in the Hampton Roads area," explains Nora, "It was comforting to know that if I need any kind of help, my friends were only a call away. I am also surrounded by wonderful neighbors who are always willing to help. We have family in North Carolina, and they are a short 5-6 hour drive away." As a military wife, Nora knows what veterans sacrifice for the freedom of our country. She explains that knowing that they are appreciated makes a big impact. She herself returns the favor by supporting wounded warriors organizations and suggests that as a great place to start. Thank you to Nora for sharing some insight into her life as part of a military family. Her husband’s service is commendable, as is Nora, as she holds down the home front.